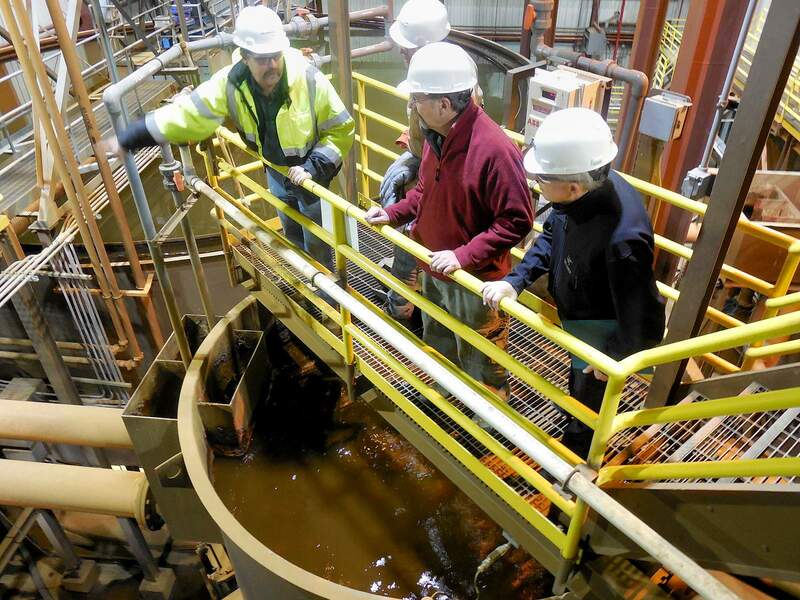 An engineer explains to Durango Mayor Dean Brookie, far right, how acid mine drainage is treated at the California Gulch Superfund site in Leadville. 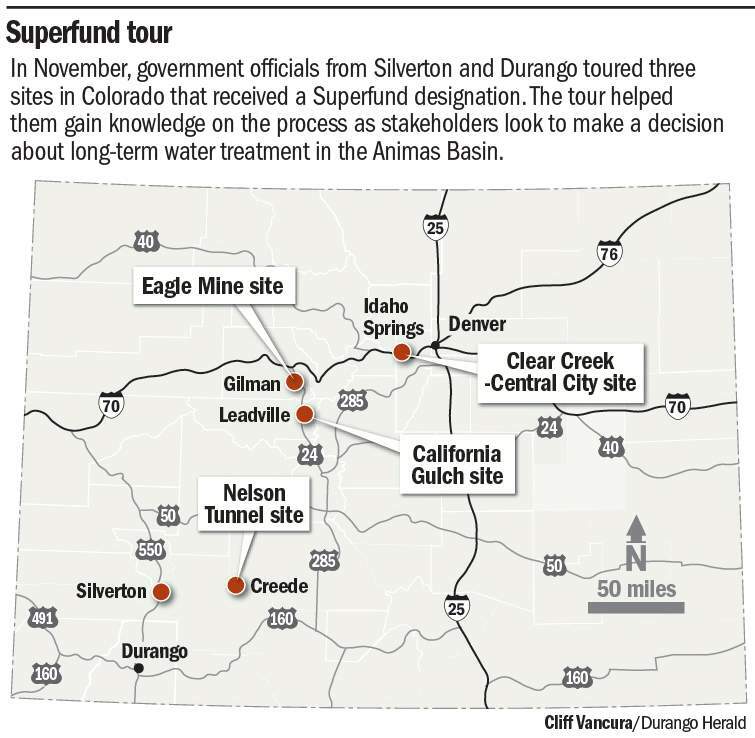 Durango and Silverton officials visited three Superfund sites in Colorado in November to see how the designation has helped clean up environmental damage from abandoned mines. DENVER – State remediation, hazardous materials and waste management officials believe that a Superfund listing would provide the best resources to tackle leaking mines in the Upper Animas River Basin. But it would not be an instantaneous fix. A listing designates a site as blighted, allowing for an influx of federal dollars for restoration. “With Superfund listings, it starts like this, the EPA wants to know what the governor thinks and the governor wants to know what the community thinks,” said Monica Sheets, program manager for the state’s Remediation Programs, Hazardous Materials and Waste Management Division. The Environmental Protection Agency generally won’t list a site without a governor’s support letter. Gov. John Hickenlooper is waiting for Silverton and San Juan County officials to offer an official opinion. The communities delayed a vote in late January, but the EPA confirmed Friday that it extended a Jan. 31 deadline to Feb.29 to assure consideration in March. 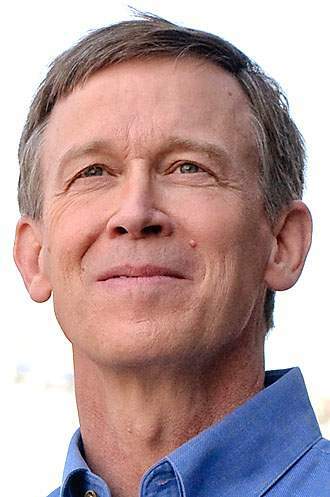 On Friday, Hickenlooper met with the mayors of Durango and Silverton and officials from San Juan County, and he said everyone wants to pursue Superfund listing. Hickenlooper said in an interview earlier in the week that it has not been easy to negotiate through the components that go into considering a Superfund listing. But Hickenlooper cited communities that have done it, including Minturn, Leadville, Creede and parts of Boulder County. And the governor emphasized that something must be done to resolve the mine contamination issue. If the Upper Animas is designated as a Superfund site, it would trigger an investigation phase, in which officials would evaluate the situation, determine the nature and extent of the contamination and look at ways to restore the site. For many years, Silverton and San Juan County officials were hesitant to push for a Superfund listing, worried that it would be a black eye on the town’s reputation and hurt its local economy, especially tourism. But Sheets said town and county officials have shifted toward supporting it. “We’ve spent a lot of effort to help them understand the benefits of the program,” Sheets said. State officials underscore that without a listing, few resources are available to them. Will the Animas River run orange again? Will fears of stigma from Gold King Mine blowout remain? What will Superfund do to property values? What will it take to get Superfund status in Silverton? Is Silverton ready for a cleanup?